Cost is $15 dollars in advance or $25 at the door. Purchase tickets above. Free food will be provided while supplies last. 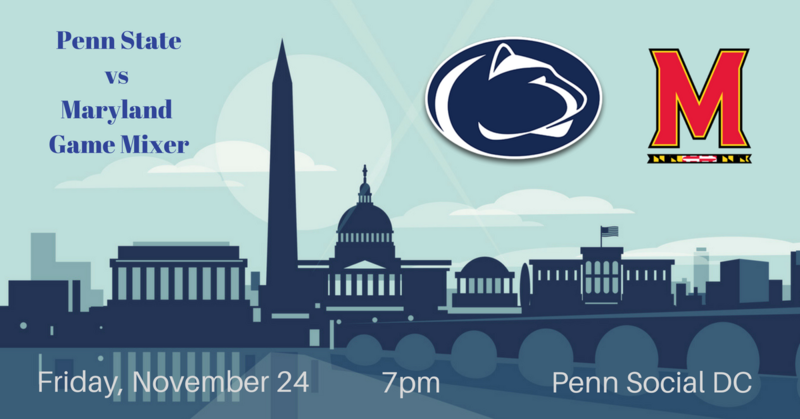 We would like to cordially invite you and your members to the Maryland Game Penn State Mixer hosted by the Metro Washington, DC Chapter and the Penn State Alumni Association. The Mixer is taking place the night before the Maryland game on Friday, November 24th from 7-10 pm at Penn Social (801 E St NW, Washington, DC 20004). At 7:30pm Alumni Association CEO Paul Clifford and Alumni President Steven Wagman will welcome alumni to a great weekend ahead. Then it's time to join the Nittany Lion, Cheerleaders and Blue Band as they get the crowd pumped up for the Maryland game the next day. Finally we end the night with one of our favorite State College bands Velveeta as they play some of our all time favorite songs. And we aren't done there. Please make sure to join the Alumni Association at College Park on Game Day for the Official Penn State Tailgate. This is an all Penn State event and we want to see everyone come out for a great weekend full of Penn State Pride and a win against the Terps.